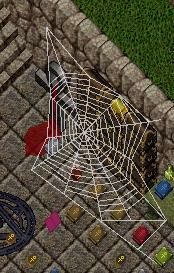 A Spiderweb Deed is a spooky house add-on introduced during Halloween 2008 and can be obtained by completing the Halloween 2008 Quest. You need to complete several steps, defeat Sicarii the spider boss to obtain a Spinneret and then 10 Gossamers to make one. This page was last modified on 1 November 2008.